Shannon discusses her experience of being diagnosed with both OCD and depression and how she has taken steps to improve her mental health. Helping to conclude National Suicide Prevention Week and just ahead of World Mental Health Day on October 10th, Mediaplanet today launches the first edition of “Empowering Young Women.” This campaign advocates for the increased awareness of mental illness in young women and the importance of destigmatizing discussions surrounding mental health. This campaign will educate an audience of young women, their parents, and school administrators about the biggest issues facing young women today. Three quarters of mental health issues first occur before age 24, with young women being the most at-risk group. Now is a crucial time to empower this group of women to seek the help they need without judgement. Even with rates of mental illness in young people at an all-time high, there is still enormous stigma and misunderstanding regarding mental health. 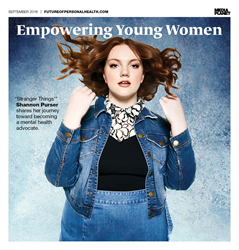 The print component of “Empowering Young Women” is distributed within today’s edition of USA Today in New York, Los Angeles, Boston, Chicago, Phoenix, Houston, Seattle, South Florida markets, with a circulation of approximately 250,000 copies and an estimated readership of 750,000. The digital component is distributed nationally, through a vast social media strategy, and across a network of top news sites and partner outlets. To explore the digital version of the campaign, click here. This campaign was made possible with the support of Netflix, Axsome Therapeutics, Hope for Depression Research Foundation, Alsana, The Gaudiani Clinic, Recovery Centers of America, Publicis Health, Recovery Unplugged, McGraw Systems, Rebecca Black, Mary Lambert, Kelly U, Ilana Glazer, American Foundation for Suicide Prevention, National Eating Disorder Association, and Planned Parenthood.